The “5 minute bread” recipe on pinterest has been calling my name. I love food that is healthy, convenient, and inexpensive. 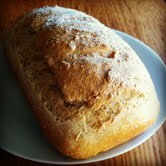 Really only 5 minutes for your own homemade artisan bread? Well the title is a little deceiving. It takes about 10 minutes to prepare, but once the dough is made and in the refrigerator your second loaf will take 5 minutes. This recipe originates from here. 2. Let sit for 10 minutes or until bubbly. 3. I did this recipe by hand, so pour the 6 1/2 cups of flour into a large glass bowl. 4. Add salt and mix with flour. 5. 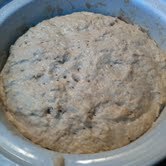 Make a little hole in the middle and add the yeast/ water. 6. Slowly pour in the rest of the water/whey ~ the leftover 2 and 3/4 cups. I did this about a cup at a time. 7. Use your hands or a wooden spoon to slowly mix together (big circular motions). 8. I am sure you could use a bread mixer/ kitchen aid. I just didn’t. 9. Dough will be moist. Cover (with a thin cloth)and let rise for 2-5 hours in a warm place (or overnight). When dough begins to collapse it is finished rising. 10. I was in a hurry this time, but next time I will let it rise longer. 11. Cover and place in refrigerator (the recipe says no oil, but it is so sticky that I put a very small amount of oil to coat it and then moved it to a smaller bowl. Do not cover tightly, it needs to breathe. Can last up to 2 weeks in the refrigerator. Ready to bake? Baking: Oven 425 degrees (edited). 1. I cut off a small amount~ grapefruit size (depending on pan size). 3. Shape (tuck bottom underneath so the top is smooth), Sprinkle flour on top, slice 3 times w/ a knife. 4. Let rise for 30 minutes. 5. Place bread dough in oven. 6. 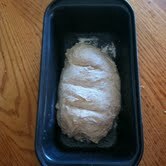 Pour 2 cups hot water into a broiler pan/ long baking dish and place underneath bread dough. 7. Bake for 30 minutes. Very GOOD! There is a slightly crunchy crust, w/ a moist center. Very similar to Panera Bread. Great with soups, salads, or sandwiches. This recipe will make 3-4 loaves. The next loaf I make will take only about 5 minutes! My oldest son loves sandwiches, and I feel great about this healthy quick recipe. 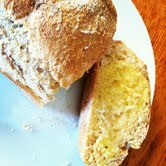 Check out my homemade butter recipe here. I made some fresh butter while we were waiting for the bread to bake. Your recipes sound so good! I live in a big city so there are only big chain grocers around. Is there an easy way to buy the liquid whey? Also, for the butter recipe which I’d love to try, where can I buy raw cream? Wish I lived near a dairy. . . I appreciate any suggestions you can send my way. Hi! Can this be made gluten free by just changing the flour to gf or would u have to change anything else? Wat gf flour would u suggest if u can? This looks amazing!! Thank you for your fast reply! Thats awesome I can’t wait to see if it turns out! I use better batter flour n Pamela’s pancake mix for flour. I have heard of the one u said, but haven’t tried it. I can’t wait to try this…yum! love the 5 minute bread!